I did my first lot of training aged 19 in Labrador, northern Canada. Back then there was no such thing as a BCD so the tank just hung in a harness on my back. I lived in a small very isolated iron ore mining town which was snowed in for 7 months of the year so my background training took place in a very large heated indoor swimming pool. The open water dive was done off the back of a small boat on one of the regions many fresh water lakes. My first boat dive was characterised by extremely cold water ( just after the thaw), huge chunks of ice floating everywhere and the 1 m visibility ( in a good moment). Oh..and abject fear! I returned to Perth and retrained as a PADI Open Water Diver then Advanced 5 years ago and have not looked back since. I have always loved being under the water for as long as I can remember. I have also loved photography – again, for as long as I can remember and was known in my family as the girl with the box brownie ( google it). I resumed diving after many many years ( and when the responsibilities of raising children were done etc) here in Perth and my two greatest loves collided in a most meaningful way – underwater experiences and photography. I just had to do both as often as possible. My first UW camera was a Canon compact S95. I had no strobes so the first images are green and not to be seen by anyone but me but things improved. I bought an INON S2000 strobe and suddenly, better images started to appear on my playback and then PC. I then progressed to 2 strobes . I seem to regress somewhat as I experimented with strobe placement but again, things got better and my images can appear on face book :). I took the big step in 2015 of upgrading to an Olympus EPL-6. The challenge to my cognition was significant as I gazed blankly at the controls on the back of the housing which did not operate in the same way as the Canon’s. I had only used the new kit for 2 dives before I went off on a liveaboard to Cenderawasih Bay in West Papua so learning the new operating functions on this dive really did cause me some tension. A year on and while I won’t say I have mastered my camera and all of its functions, I can say that I am more at ease with it and don’t feel quite so overwhelmed when I study the back of the housing in readiness for a shot. This is hard to define. 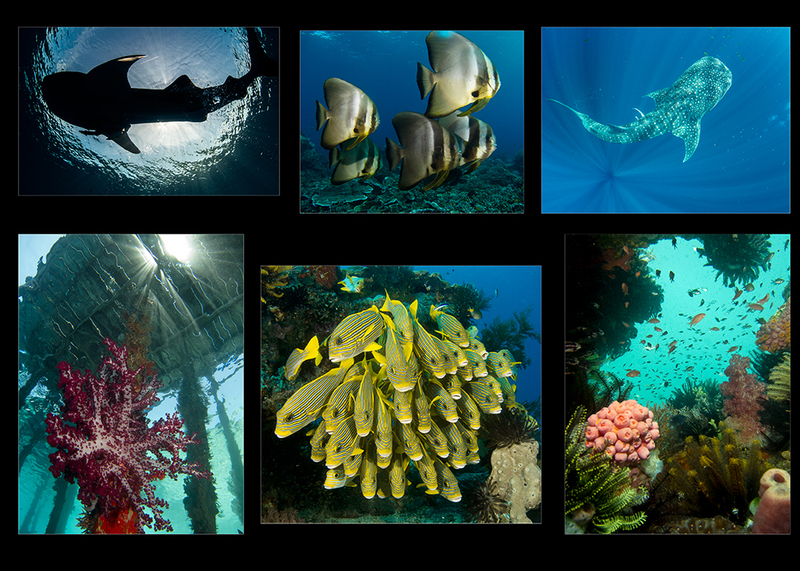 I just adore diving so all sites I have visited have interest to me. However I particularly enjoy diving at Rottnest and off 3 Mile Reef here in Perth. KGT, Ammo and the BHP jetty are all wonderful for their diverse range of critters to photograph and the relative ease of diving there but I love striding/rolling over the back of boats and exploring swim throughs etc off our coast. I have not dived interstate but there are sites I plan to visit – Great Barrier Reef would be one. I have now been fortunate enough to travel to several overseas locations in my current dive life – some as shore based trips and others liveaboards. Raja Ampat would have to be my most favourite location/overall trip due to the range of underwater life to view and to photograph followed closely by Cenderawasih Bay with the whale sharks. Liveaboard ‘immersion’ diving now takes the lead as my preferred dive trip simply because I just love being on boats and all that this means. Nothing beats lying in the bunk after a 4-dive day being rocked and soothed by ocean movement and then do it all again the next day. I have 2. The open water boat dive following retraining took place in 2013. I was nervous but also excited and the operator took us off Burns Rocks for the first dive. Somehow I ended up on the bottom first and started to orient myself with my equipment while waiting for the team to group. Suddenly, my mask was filled with the vision of a very large and very curious seal who I think was admiring itself in the mask reflection. I could also see some teeth so just watched and stayed calm to ensure it didn’t bite me. It then decided that my fins were edible items so it started to bite my fins. I finned backwards out of its way but it followed me nibbling and pulling then zoomed off to play with a mate who joined us. They both decided to whizz around me but they were just playing and by then I had relaxed to enjoy the experience. The second memorable experience was my first dive with the whale sharks in Cenderawasih bay. I felt truly excited to have this opportunity to photograph them but as I said, I was also new to the Olympus and interchangeable lenses. We got in and under and I started to prepare my camera to photograph the gorgeous creatures surrounding me. I couldn’t figure out why I couldn’t see through the screen on the housing until I turned the camera around and noticed that I had left the lens cap on the fish eye lens. I felt so embarrassed and stupid that I just hung in the water for a few minutes resigning myself to this dive as an observer only. The tour operator noticed my demise and yelled ‘ get back to the boat now and take off that cap’ ( as you do under the water). I swam like there was no tomorrow, caught the tender before it returned to the mother ship and managed to get back in time to take some shots. The ABC featured a series recently on how to stay young. Various activities both physical and cognitive were explored but diving/photographing was not mentioned. While I don’t consider myself old, I am also returning to this activity as an older person and I would say that that we can add our love of photographing the underwater world to the list of adventurous activities that keeps us young at heart and cognitively humming!